In my article ‘Molecules and Art’ I talked about bios, researches, and arts as applications of mind mapping. This article gives some examples of pairing users and developers, or generally speaking, pairing people with different skills. Developers are technicians and users are users. Cloudy error messages and technically oriented manuals are not what users should expect after purchasing a software product. Salesman need a brief overview of the product’s key features. Managers have to explain their strategies to the midlevel staff. Is there an effective method to seamlessly connect people with different skills and hence talking different ‘languages’? Mind maps may bridge the gap. Here are some examples. Users of software applications don’t want or are not able to think about the appropriate file management for the data they have to work with. Developers usually don’t want to deeply engage in the specific fields of activity of their users. So how can developers be paired up with users? What is a common platform for technical and functional responsibilities? Mind maps may help as they reflect the requirements of users as well as the more technical thoughts of developers. 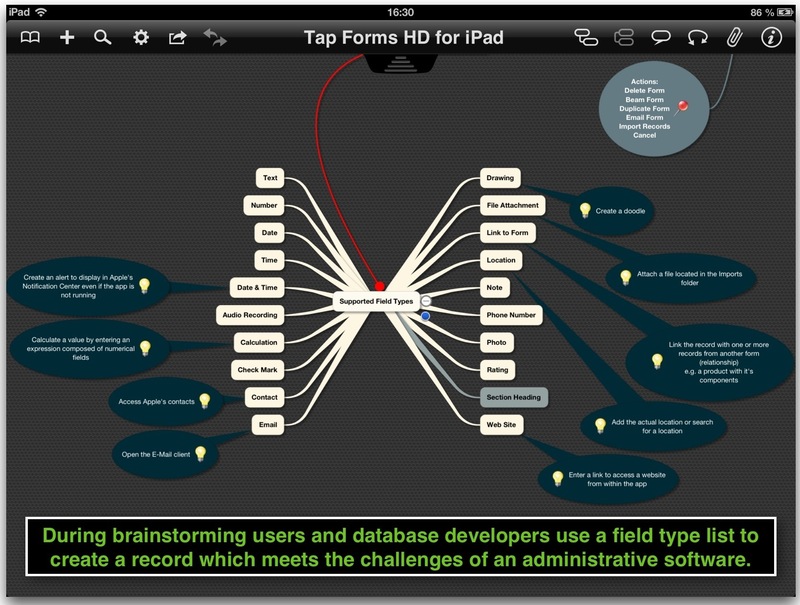 Here are the fields available in Tap Forms HD database app for the iPad. Both, developers and users can bare their thoughts in a mind map. There are no special skills required to use this common platform for the description of tasks and the communication. Different skills of users and developers are leveled to a graphical view of the task and therefore communication is enhanced. The result may be a more efficient software application and the mind maps may serve as a common knowledge base for future updates and improvements. A further benefit could be the disclosure of inconsistencies in the UI design. 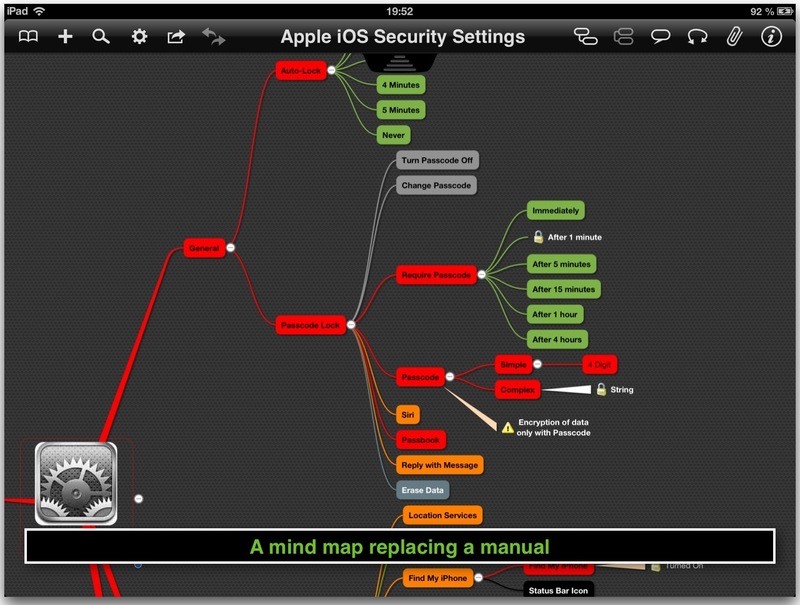 See my mind map about the Security Settings of an iOS device where settings are widely spread over lots of sections in Apple’s settings app. This mind map may be also used as a manual for security settings. 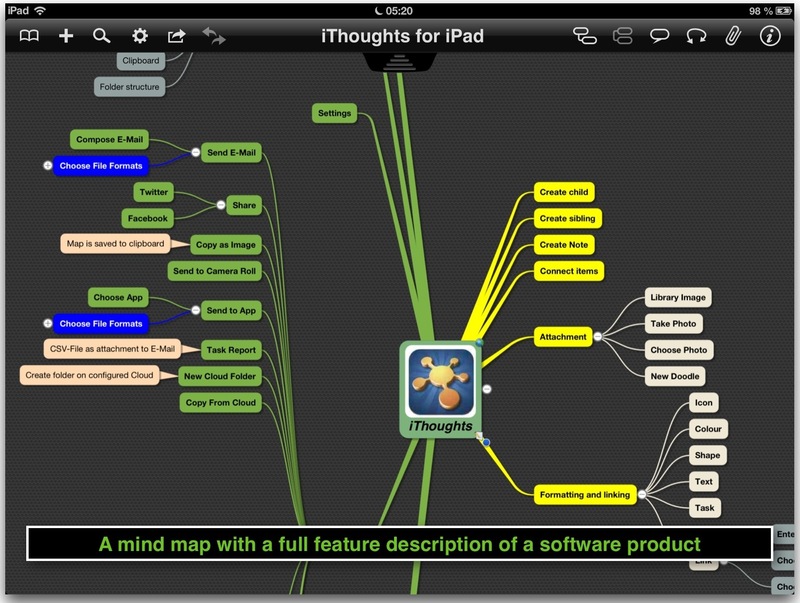 See this mind map which describes all features of the mind mapping app iThoughts HD for iPad, developed by Craig Scott, UK. Each operating system should have an integrated viewer (an engine for displaying mind maps which is open to the developers to fill with content) which provides interactive usage of mind maps as a replacement for textual descriptions. Think of a help system where you can expand the topics you are interested in. Mind maps are simply more attractive with additional usability. The well-known ‘Search’ implemented in help systems is also available in mind maps. So there is no need for textual descriptions any longer. Admittedly this is only valid for applications with a strong focus on ‘easy-to-use’ and mostly ‘self-explaining’ features. If there is a need to comment all topics mind maps loose their simplicity and textual descriptions are more effective. Developers can explain the main features of a new device by creating a mind map. Salesman and potential customers can use this map to easily inform about features of the product. Tap on an image to enlarge the whole map or the snippets. The benefits are that shop assistants can easily assimilate the features by the brain and remember them a longer time. Whenever you are confronted by a problem mind maps help you see all the issues and how they relate to each other. They also help professionals to quickly get an overview of how you see different aspects of the situation, and their relative importance. Industry leaders develop strategies which have to be explained to teams. Mind maps are suitable for communicating the objective of a project, the different tasks involved, and most importantly the role and function of everyone in the team. Part of being a good leader is being an effective communicator. The usual and I think a bit old-fashioned way is to use Powerpoint/Keynote presentations e.g. for software applications training. There is always just one slide visible and if there is a need to scroll back you cannot see the slide where you came from. In a mind map just expand a branch and after finishing the discussion collapse it and continue with the previous topic. Comments and Likes are highly appreciated.